This morning I presented some concept sketches to a client in Wandsworth. 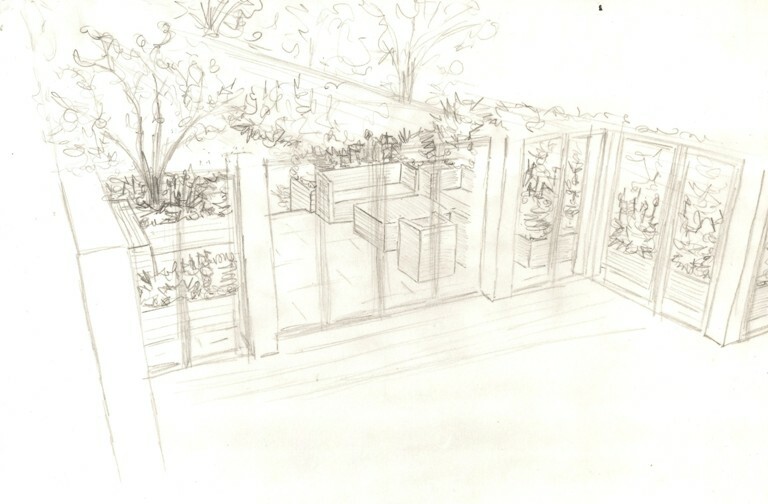 They are in the middle of a building project to change the layout of their kitchen and dining area which means that the terrace in the back garden now needs to be reconfigured. When it’s finished, the back of the house will be glass so it’s really important that the terrace looks fabulous all year round. As the dining table will be visible from the garden, we decided that there was no need for another eating area on the terrace. Instead we are going for a sophisticated lounge feeling with outdoor sofas and raised planters. The finished level of the terrace will be the same as the finished kitchen floor height so it is also really important that the materials used on the terrace complement the materials used in the house. The new kitchen will be very contemporary with a white washed oak floor. The rest of the garden, which will remain unchanged, is really very informal so I have to take care to ensure that the terrace not only looks great with the house, but also feels at one with the rest of the garden. On the left hand side of this picture you will see a small inlet between the boundary wall and the glass wall of the house. This “dead space” has materialised as a result of a planning restriction and needed to be addressed. We discussed the possibility of a water feature for this area as it will feel very much a part of the inside space, but my clients were really keen to incorporate plants into this area instead. 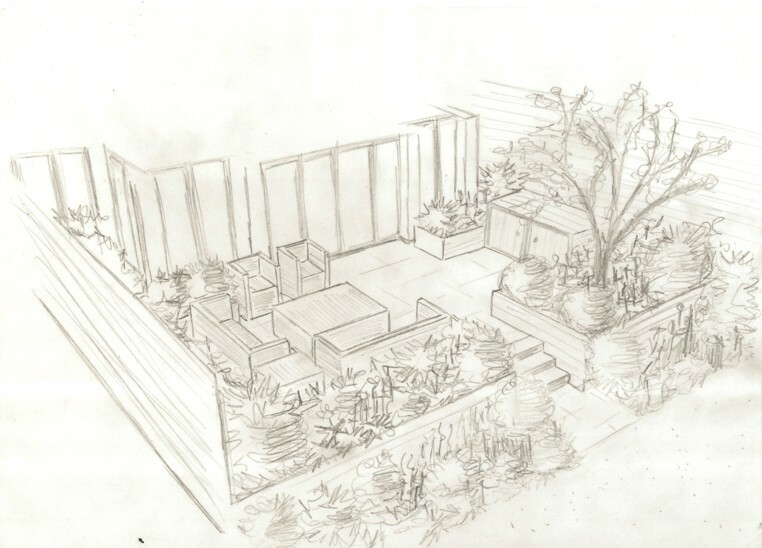 The timber raised planters will give the space 3 dimension and will be softened with all year round planting. 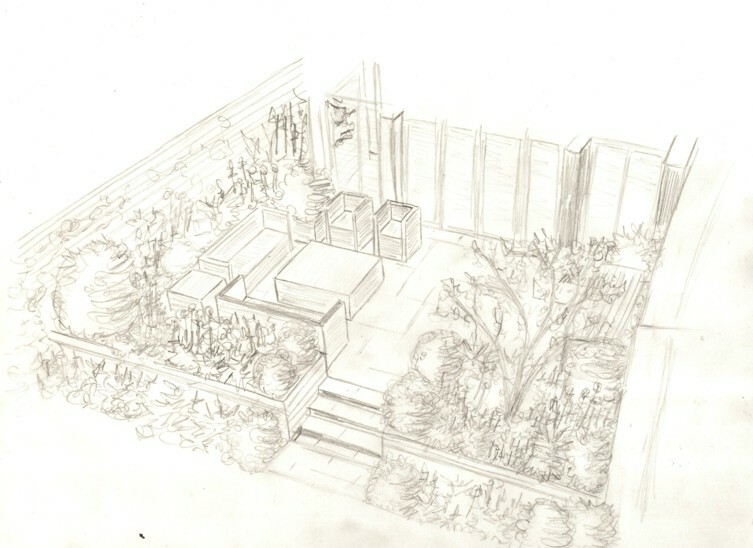 We will also incorporate some aesthetic lighting around the terrace and further into the garden so that the house is linked to the garden even throughout the winter months. I think it will be a gorgeous place to sit when it’s finished, certainly somewhere that you’d be more than happy to sit and enjoy a glass of something cold!